In 1913 there were already plans to build a new town hall in response to the growth of Hilversum municipality. When Dudok became Director of Public Works in 1915 the idea of a competition usual for such projects was abandoned. During his first month in office the ambitious architect had already designed a traditional town hall destined for the town centre. Because of the Great War and lack of funds it was not until 1924 that Dudok presented his definitive design. All original doubts as to his capacities particularly among fellow architects promptly vanished. 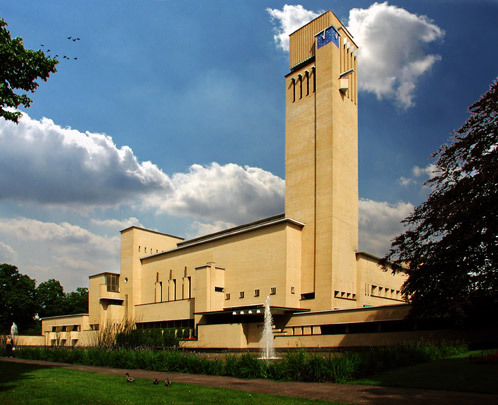 To promote the design Wijdeveld devoted an entire issue of Wendingen to it and a petition was organized urging its construction. This subsequently took place between 1927 and 1931. A site devoid of building lines and with no restriction in height allowed Dudok free rein. The city hall, rising in stages from its parklike surroundings and culminating in a high tower, was designed from the perspective drawings. It consists of two squares: an inner court enclosed by offices and a second courtyard surrounded by low-rise and a caretaker's residence and bisected by a service road. A path extending along the monumental south facade with its expressive window openings, awnings, balconies and the tower, leads to the main entrance, which is used on official occasions only. In bad weather an arcade parallel to the main entranceway can be resorted to. The tower contains a monumental stair to the first floor on which is the council chamber with its tall narrow windows graced with light fittings and a balcony. The characteristic vertical mass adjoining the council chamber contains a public gallery, landing and archives. Next to these is Dudok's own office with its large corner window. On the east side of the first floor is the civic hall, barely separated from the corridor by a row of round columns. Besides these principal points of interest the building contains many other details and accentuations in colour and material, notably above the oblong storage volume on the north side where the roof, attached to it by strips of glass, seems to hover. As building was carried out under municipal supervision many details inside and out are Dudok's own: the size of brick in the facades, the furniture, the upholstery, the lettering, even the door-handles. The structure consists of loadbearing walls, concrete floor slabs and concrete lintels above the horizontal windows, whereas the council chamber's roof structure is of steel. This perfect synthesis of traditional Scandinavian architecture, Amsterdam School ornament and abstract New Objectivity has earned widespread admiration. Its well-balanced masses make it a synthesis of functionalism and romanticism. There has been criticism, however, of the non-constructive 'irresponsible arrangement and proportions of its forms'.